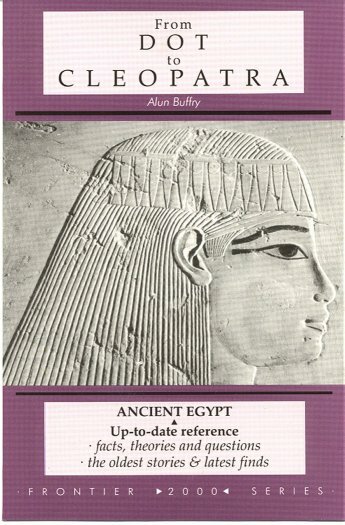 You can find a list of Alun Buffry's other publications and published letters here. As with many surnames the spellings changed a lot especially before the 20th Century. MOTTO TRANSLATED: NEITHER TO SEEK NOR DESPISE HONOUR. Click here to go direct to the BUFFREY / BUFFRY line since 1600. Towards the bottom of this page there is a list of more people sharing the surname but as yet unplaced in the family tree. If you have any positive suggestions please mail me. When the ancestors of the Buffry family emigrated to England following the Norman Conquest in 1066 they brought their family name with them. They lived in Staffordshire, where they were lords of the manor Colton. Spelling variations include: Buffery, Buffrey,,Boughey, Buffie, Boffey, Buffey, Boughie, Boffie, Boghey and many more. First found in Staffordshire where they were Landowners near the Manor of Colton from very ancient times. Some of the first settlers of this name or some of its variants were: James Boffey who landed in North America in 1764. “The Boughey's were not Lord's of the Manor of Colton but owned a substantial farm in Colton. The farm had been a Grange farm for St. Thomas's Priory in Staffordshire up to the Dissolution of the Monasteries by Henry V111. The land had originally been given to the Priory in 1264 by the then Lord of Colton Manor William de Wasteney. “At the dissolution the Bishop of Lichfield Bishop Lee requested the Priories lands from Henry to give to his orphaned and "supposedly" impoverished nephews- the Fowlers. The farm came into the hands of Thomas Fowler who subsequently sold it in the 1540's to Sampson Boughey. I think as far as I can certain he was from the Boughey branch of the family in Audlum North Staffs. It passed from Sampson to his son George and then to his son Sampson. This last Sampson only had daughters. Upon their father's death they became joint owners. Constance the youngest daughter married Whitehall Degge son of the famous Staffordshire antiquarian Sir Simon Degge. Together they bought out her sisters and became sole owners of Boughey Hall farm. “Soon after Whitehall died leaving Constance with one son. Two years later she married Sir Thomas Whitgreave of Mosely Old Hall near Wolverhampton (now National Trust) and one of the rescuers of the future Charles 11 when he had fled from the Battle of Worcester. By this marriage the farm passed into the ownership of the Whitgreave family and remained with this family until the 1920's. It is no longer a working farm but a collection of barn conversions. However inside the main farmhouse there are still parts of the hall that was there in the time of the Boughey family. “I did a research project on this farm as my study for a certificate in Local History from Keele University. Roger BUFFERY, occupant 1255 - 1262 dead before 1269, possible son of William BUFFERY III. The Burnett family owned the manor until it was eventually sold to freeholders, or bought by the Leveson or Wrottesly families, with whose descendants it remained. From The Salter History Collections of Staffordshire: with reference to the 'Trescott Charters' and the BUFFERY gift to the monks of Combe. William BUFFERE III was the underlord of the Barons of Dudley at Nether Penn and Paddington-Bray in Surrey in 1174. William Fitz Warine was a sub-tenant at Nether Penn. Both were fined for their disaffection during the rebellion and their names appear on the Pipe Roll of 22H III among the tenants of Gervase Pagnel.. On the Fine Roll of II H3, The Sheriff of Surrey was ordered to take into the Kings hands the land of William BUFFARE in Paddington, referred to as Paddington-in-Bray. "The Testa de Nevill states that padinden in Surrey, was taken into the King's hands on the occasion of the outlawry of Amice Wylekun, who was received into his house by William BUFFARI, and was found there: and that Benedict, a certain Jew of Chichester, afterwards claimed it as his pledge, producing a dee of William BUFFARI to that effect; but the King retained it in his hands, and gave it to Alan Trenchemer; and on the death of Alan, King John gave it to William de Brause, and after William, it was given to Peter de Maulay...". William Buffary, Lord of Nether Penn, was imprisoned for many years for sheltering an unfortunate woman who had been outlawed. Staffordshire Historical Collection Vol III, p 221 (in Latin) the charter by which William BUFFARY, son of WILLIAM BUFFARY, concerned for the safety of his soul, grants a portion of the land near Trescot to the monks of Combe, 1190 - 1199. The gift was unconditional and even the token rent of one pound of cummin was refused. At Westminster, 8 July 1200, Sibilla who had been the wife of William BUFFERE II, was represented by her son William BUFFARY III, complained against Walter, Abbot of Combe, represented by Nigel the Monk. Sibella lost the case as William II had not died in possession of the land which she would otherwise have received one third portion of (Widow's terce). "In 1236 Peter de BUFFER was arrested and later hanged for conspiracy. This, like the modern BUFFERY, is a form of BOUVERIE, meaning ox-farm.... The Peter de BUFFER was one of the King's doorkeepers." [Justice and Crime by W.D. Bowman, Faber and Faber 1932]. Robert BUFFERY, in 1272, also contested that his great grandfather had not given the lands and that it was only a ten-year lease. He also lost his case. In 1356, Richard de Fynchenesfield was charged with procuring William son of Hugh de Penne and Thomas BUFFERY to kill John Matheu at Whytewyk (Whitwick) in the Manor of Tettenhall. Today, in Dudley, there is a BUFFERY ROAD, and a BUFFERY PARK. Parish of Newland, Abode: Coleford. Alun BUFFRY - born 1950, Barry, Glamorgan, UK. I have just come across your Buffery Family history on the web. I believe you have traced your line back to William Buffery and Martha Perks in Oldswinford in 1640s. I believe William’s family came from the neighbouring manor of Cradley and may have settled in the Lye area in the 1630s. In Nigel Perry's history of Stourbridge. PG 32 and 33 there are a couple of passages that illuminate this period. He says that the Addenbrooks were a major force in the area owning coal and clay mining rights and water mills along the Stour. In 1627 Samual Addenbrook built a cottage for his son Henry Addenbrook on Lye Waste. By 1638 Henry had been joined by John Perks, William Bache,John Buffery, William Hill, John Westwood, William Round, John and Thomas Syddaway and John Millward. I have traced family lines back to several of these individuals and now realise they all have nailing and Scythe making as an occupational background. It was obviously a close knit and inter related community. 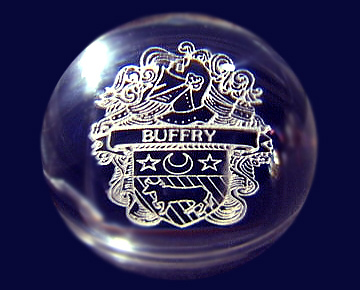 I think your William Buffery and Martha Perks are most likely related to John Perks and John Buffery above. The Manorial records of Cradley show that several of the above families had connections with that manor. For example Thomas and John Syddaway were both manorial Tenants. The Westwoods owned a scythemill in Cradley and there is a William and George Buffery who were also tenants. I think your William is the son of this William and was bap 12 Nov 1592 at Halesowen although his parentage is not given. This William married Cecily Hawkhead @Halesowen 8th Oct 1576 and had a several children including George above. Married Alice REID, 11 Jan 1667/68 in Pedmore, Worcs. Christened 3 November 1716, Old Swinford, Worcestershire. o Martha BUFFREY, Christened 16 March 1743/44, Old Swinford. Margaret TYLER Christened 3 Feb 1745/46, Newland, Glos, daughter of Henry TYLER and Elizabeth KEDGWYN, married 10 Feb 1744/45 in Newland. Elizabeth KEDGWYN was daughter of Thomas KEDGWYN (2) born 1692 Newland and Elizabeth KEAR, born 1701 Newland, married 28 Jan 1716/17 in Newland. Elizabeth KEAR was born 1701 in Newland, daughter of Richard KEAR and Elizabeth WORGAN. 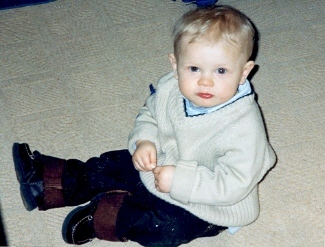 Thomas KEDWYN (2), born 1692 in Newland, was the son of Thomas KEDGWYN (1) and Margaret BANISTER. In 1765 Worgan BUFFREY, born 1737, married Margaret TYLER (an orphan) by Special Licence in Newland. His bondsman was William WORGAN. Worgan as a Christian name was and is unusual to say the least. However, as a surname in the FOD it was very common. It was also common in those times for a first born son to bear the maiden name of his mother as a Christian name (especially if the mother came from a higher social standing than the father). Worgan was born in 1737 in Old Swinford, Worcestershire, to Deborah WORGAN and Joseph BUFFREY. By chance (and we all know this is not infallible) there is only one Deborah WORGAN in the whole of the IGI and, guess where she was christened??? Yes, that's right, in Newland FOD!! Not only that, but she has a brother William - could this be Worgan's Bondsman? - could Worgan have moved back to his maternal family's home to find work? As yet, we have not gone any further into this, but I'm sure you can see that this theory is feasible. (Just to add to this, I have the microfiche for Old Swinford covering the pertinent times and there is a Deborah BUFFREY being buried at just the right age to coincide with her baptism in 1711. Worgan and Margaret TYLER married in 1765 and then the first thing we find after that is an entry in the IGI and confirmed with the Bishop's Transcripts for Newland: Joseph WORGAN, baptised 02.02.1769, son of Buffrey WORGAN and his wife Margaret. We can see from this that BUFFREY was not a usual surname in the FOD, in fact, I think that Worgan was what we might call a "first footer" into Gloucestershire. We also find Elizabeth BUFFREY (daughter of Worgan and Margaret BUFFREY) buried at Clearwell. 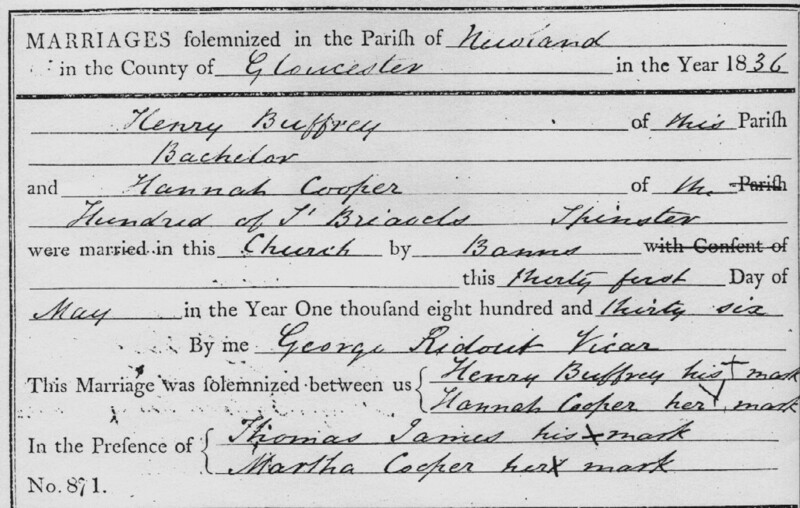 James BUFFRY, born 1780, at Clearwell, Glocs, England, in the presence of Joseph BUFFRY - note spelling on the marriage certificate is BUFFRY. Died July 1st 1834, buried in Newland - note spelling in Burial record is BUFFREY. Together they formed the BUFFRY FAMILY STRING BAND. 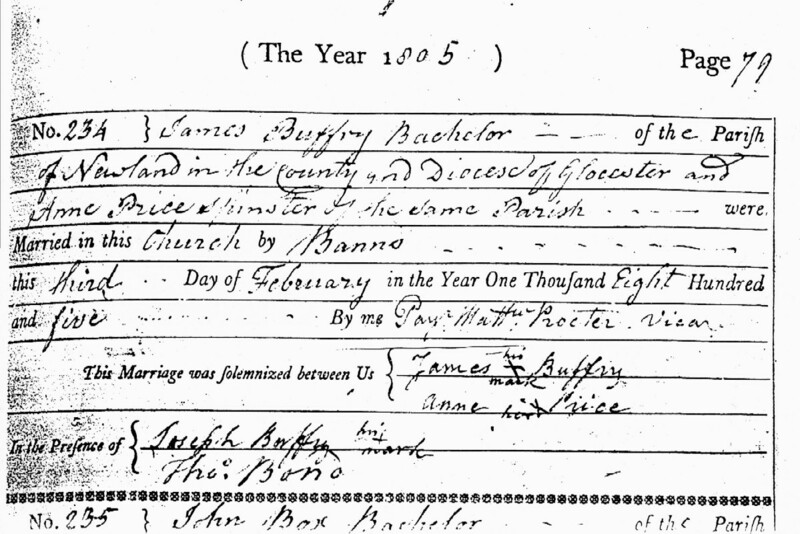 There was also a John Buffery (son of Joseph, a scythsmith) married my ancestor, Ann Chance, at Kingswinford in 1793. They moved to Cradley & had a family. After Ann died, John married twice more before dying in 1841. HENRY BUFFRY (1), aka "Old Henry"
Born 1771, son of Worgan BUFFREY and Margaret TYLER. Died and buried in Newland Parish in 1844 but supposed to have been aged 79; note spelling in record is BUFFREY. Married Mary STEVENS, born 1786, married Newland, 17 November 1810. 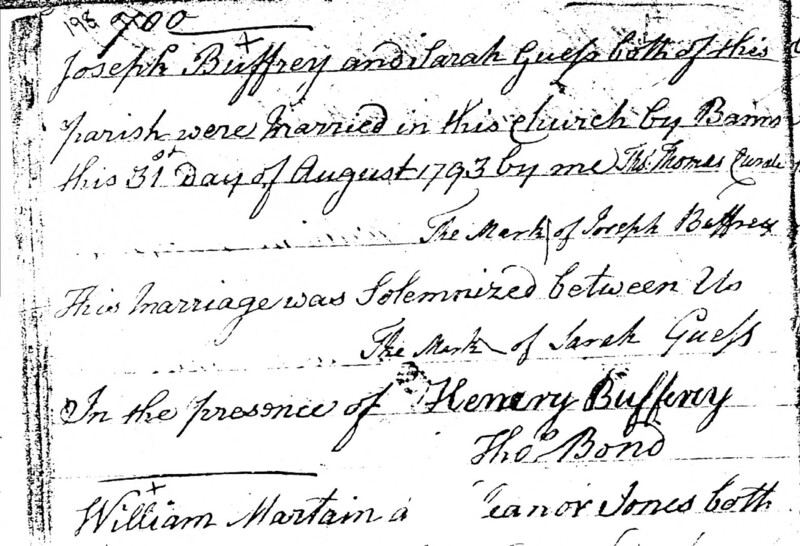 Note spelling on marriage certificate is BUFFRY although he signs his name BUFFREY..
Mary STEVENS was a daughter of Richard HAWKINS and Sarah STEVENS (married 2 November 1789). Christened 21 May 1786, Newland, Glos. 60 Coopers Trump, St Johns, Cinderford, Glos. Married Hannah Cooper, born 1815, Cinderford, on 31 May 1836; Married at Newland 31 May 1836, in the presence of Thomas James and Martha Cooper. Spelling is BUFFREY. Dinah BALDWIN, born 1784 in Little Dean, died 26 July 1851. Richard COOPER and Dinah BALDWIN's daughter was Hannah Cooper, born 1815 Cinderford, died 24 June 1882, married Henry BUFFREY (2). See also the Indenture of 1883. Henry and Hannah BUFFREY are both buried in St Johns, Cinderford, Glos. Joseph William BUFFREY, BAB 1841. 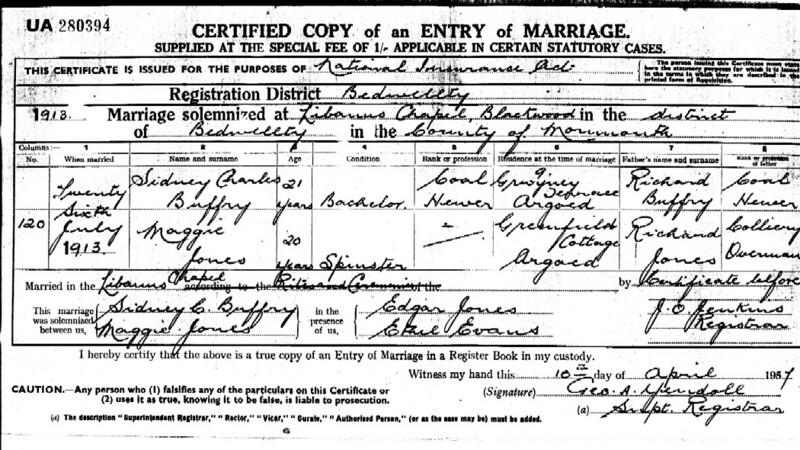 Married Elizabeth SHINGLER 1865 (moved to Shireoaks), Spelling on Baptism record is BUFFREY. o Joseph William BUFFERY bapt. July 18 1875 at St Johns. Note spelling in Parish Record is BUFFERY. 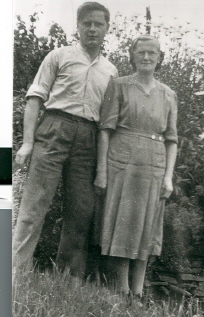 Ronald married Elsie Forshaw - there children were Linda, Paul, Susan, Jill and Trevor. Paul Buffrey is father of Rachel Buffrey. Samuel BUFFREY, BAB 1850, died aged 72, 21 December 1917, buried at St Johns, Cinderford, Glos. NB: Samuel's father is entered as Edward on the marriage certificate although elsewhere it was Henry, son of Old Henry. Rhoda was a district nurse. o Mary Ann BUFFREY, born 1871; married Albert William POWELL, 30 Dec 1893 at St Johns Cinderford, Glos. ; witnessed by Rose Annah BUFFREY. o James BUFFREY, born 1878, Cinderford Tump, Glos; Collier. Married Mary Ann Jessie Elizabeth WHITSON, 12 Oct 1899 at St Johns, Cinderford, Glos., (daughter of Thomas William WHITSON, and engine driver), witnessed by Thomas William and Emily Florence WHITSON. o Maud Alice BUFFREY born 6 Feb 1909, died 27 Aug 1970; married Thomas Daniel NELDER (2), son of Thomas Daniel NELDER (1) born 13 Feb 1897 and Melinda Caroline GAPPER. Maud Alice and Thomas' daughter is Janet Kathleen NELDER, born 4 Jan 1939, Cheltenham, Glos, England; she married Albert Edward COURT on 24 Aug 1959 in Cheltenham, born 25 Aug 1936, son of Bert COURT and Mabel Gladys Julia HASLUM. o Joseph BUFFREY, born 1880 ??? o Enid MariaBUFFREY, born 1889; married Ambrose Harry GRIFFITHS, 26 May 1914, at St Johns, Cinderford, Glos. o Joseph William BUFFREY, born 1882, married Dora May Beard, 23 March 1907 at St Johns Cinderford, Glos. o Arthur BUFFREY, born 1887; died 7 May 1949, buried at St Johns, Cinderford, Glos. Married Florence May NASH, 5 Aug 1912, St Johns, Cinderford, Glos., buried at St Johns, Cinderford, Glos. 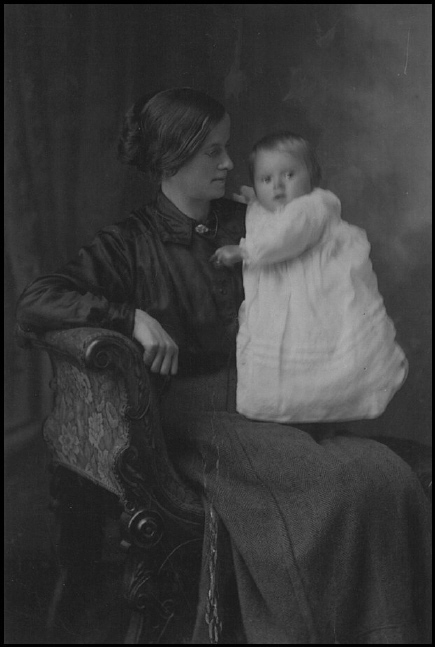 o Mary Alice BUFFREY, born 1889; married Walter Henry MORGAN, 28 March 1914 at St Johns, Cinderford, Glos. Changed surname spelling to BUFFRY. Matthew Henry BUFFREY, born 22 July 1873, died 26 January 1945, buried at St Johns, Cinderford, Glos. Married Elizabeth Agnes Wood, born 1/12/ 1897 died 3 March 1963, buried at St Johns, Cinderford, Glos. George Ernest BUFFREY, born 12 Feb 1875, died 7 February 1931 in colliery accident. Married Blanch Smith, 25 August 1898 (daughter of Amos Smith) at St Johns East Dean, Cinderford, Glos. Resided at Ruspidge, Cinderford. 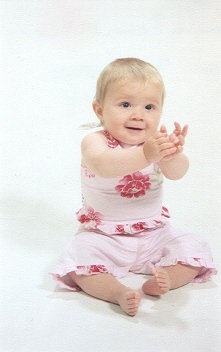 Granddaughter: Cathrine. Walter Parry BUFFREY, born 25 March 1882, died 3 Dec 1962 buried at St Johns, Cinderford, Glos. Married Mary Jane Rodway 26/5/1902, died 9 January 1964, buried at St Johns, Cinderford, Glos. 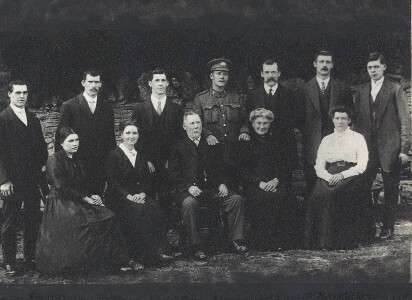 Married at Libanus Chapel, Blackwood, Wales, 26 July 1913. Labourer British Railways and BP Plastics, Barry. Transported to Australia aboard the ship "Indefatigable", arrived 25 April 1815, having been convicted of robbery and sentenced to 7 years. Resided in Appin, New South Wales. Religion: Protestant. Height 5'1" or 5'7" and 3/4. Complexion: shallow; hair: dark brown; eyes: dark. Married Mary Reagan in Church of England Parish of Cambelltown with the consent of the Governor on the 10 May 1830, by Thomas Reddall, the first Rector of St Peters Church, Campbelltown, NSW. Mary Reagan, born 1808 Limerick, Ireland; died 12 October 1858, buried 15 October 1858 Sydney. Cause of death: bronchitis. Transported on the ship "Grenada 4" in 1826, after conviction for shoplifting and sentence to 7 years. Resided in Campbelltown and assigned to John Howe from Windsor. Religion: Roman Catholic. Convicted London, 20 February 1826. 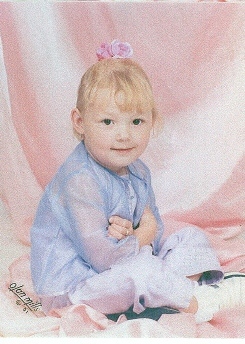 Height 5'3"; complexion: ruddy; hair: brown; eyes: grey. 1. Catherine Davis, born 1835-6, died 29 May 1860, Wagga. Buried Wagga Cemetery.. Married at Presbyterian ceremony by Rev. Patrick Fitzgerald. born at Tarcutta, buried Woronora Cemetery, Sydney. 2. After the death of Catherine, Charles married Sophia Bollard in Wagga in 1868. 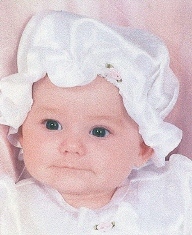 Sophia born 14 June 1850, Picton NSW. Died 22 June 1932. Buried Narrandera Cemetery. James BUFFREY, born 19 Sept 1869, died 11 July 1954, buried Narrandera Cemetery. Married (2) Ella Louise, born 1880, died 29 October 1948, aged 68. "The Man who rode the Bull through Wagga"
WELL-KNOWN WRITER, Alan Marshall, recently put forward what looks like a solution to a mystery that has long puzzled many of us - Who was the man who rode the white bull through Wagga? That wonderful Australian, Dame Mary Gilmore, who was born in Waga, wrote to Mr Marshall: "The white bull was in the first circus to put up its tent in Wagga. It was owned by Mrs Brown and managed by her half brother, Harry Moxham. He did, and it went as quiet as a lamb. I saw it turn the corner as it went into the main street. It was all I saw of the riding." Alan Marshall continues: "So, through Dame Mary Gilmore, we now know the name of the man who rode the white bull through Wagga. When I was a boy someone chipped us with being the man who rode the bull through Wagga, we always retorted, 'No, I'm the man who rode the crowbar through China without giving it a sore back.'" Rode the famous bull through Wagga Wog-ah"
The legendary Bidgee Bill must now retire in favour of Mr BUFFREY, not so romantically named, perhaps, but justice must be done. Married George Henry Davenant, in Victoria in 1880. Born 1850-1851 Gippsland, Victoria. Lillian Roslyn Griffiths, born 9 Dec 1911, Sydney. Died 26 Aug 1942, Syndey Australia. 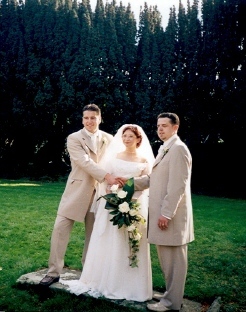 Married John May. Son George May died in car crash. Sydney George Patey Griffiths, born 4 Oct 1913 Sydney. Married Joseph Newmarch, born 29 Apr 1911, Canada. 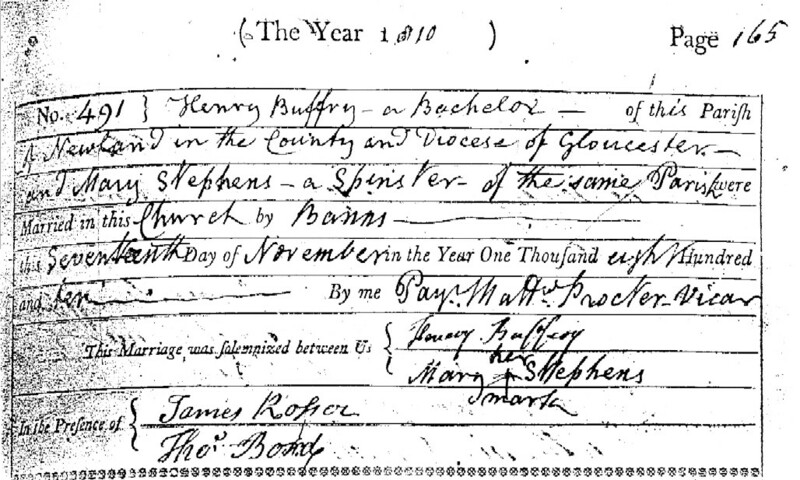 The first BUFFERY at Radway was Thomas BUFFERY, a malster from the neighbouring parish of Ratley, married Mary Usker on 11 February 1779. Son of Thomas BUFFERY, born 3 January 1783, died 2 December 1858, aged 75. 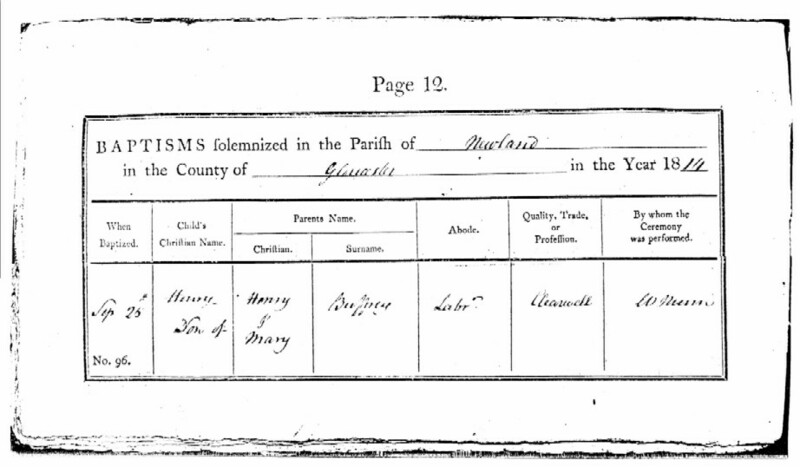 Married Sarah Shennington of Gloucs, at Radway on 12 September 1808. 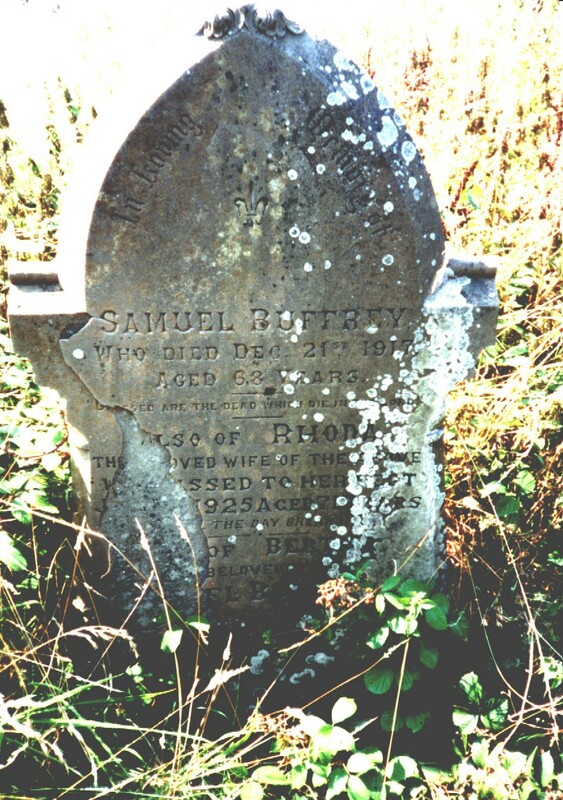 Son of Robert BUFFERY, baptised 31 May 1816, died 1880. Married cousin Elizabeth Ridge, daughter of a publican, at Akeley Parish Church on 25 August 1845. Resided at Wardington near Banbury. A draper. 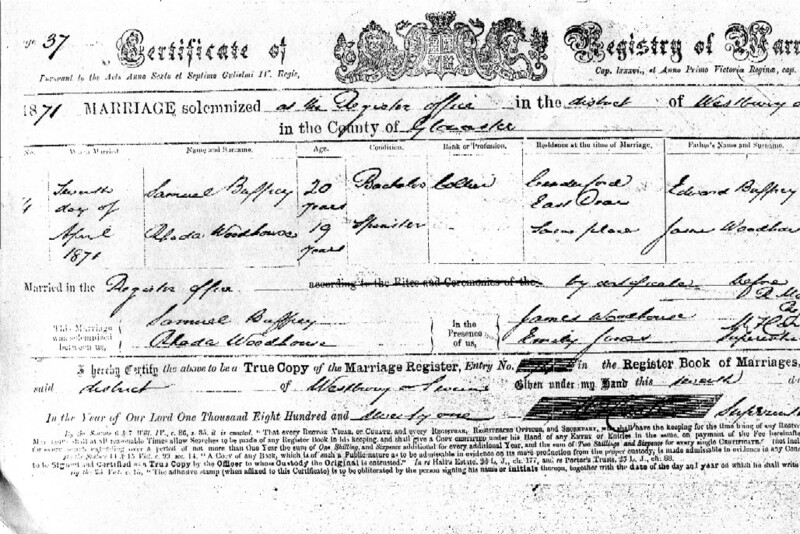 Thomas BUFFERY, son of William Ridge I, born 16 Oct 1851, moved to Birmingham, married? Joyce (daughter of Major) married ? Children of Joyce and ? Married Jane Sophia Townsend on 22 September 1874 at Broadwell Church, near Stow-on-the-Wold, Glos, UK.